On 15 June 2006, the British government agreed to jail Taylor in the United Kingdom in the event that he was convicted by the SCSL. This fulfilled a condition laid down by the Dutch government, which had stated it was willing to host the trial but would not jail him if convicted. British Foreign Minister Margaret Beckett stated that new legislation would be required to accommodate this arrangement. While awaiting his extradition to the Netherlands, Taylor was held in a UN jail in Freetown. When Taylor's trial opened on 4 June 2007, Taylor boycotted the proceeding and was not present. Through a letter that was read by his attorney to the court, he justified his absence by alleging that at that moment he was not ensured a fair and impartial trial. On 20 August 2007, Taylor's defence, now led by Courtenay Griffiths, obtained a postponement of the trial until 7 January 2008. During the trial, the chief prosecutor alleged that a key insider witness who testified against Taylor went into hiding after being threatened for giving evidence against Taylor. Furthermore, Joseph "Zigzag" Marzah, a former military commander, testified that Charles Taylor celebrated his new-found status during the civil war by ordering human sacrifice, including the killings of Taylor's opponents and allies that were perceived to have betrayed Taylor, and by having a pregnant woman buried alive in sand. Marzah also accused Taylor of forcing cannibalism on his soldiers in order to terrorize their enemies. On 8 February 2011, the trial court ruled in a 2–1 decision that it would not accept Taylor's trial summary, as the summary had not been submitted by the 14 January deadline. In response, Taylor and his counsel boycotted the trial and refused an order by the court to begin closing arguments. This boycott came soon after the 2010 leak of American diplomatic cables by WikiLeaks, in which the United States discussed the possibility of extraditing Taylor for prosecution in the United States in the event of his acquittal by the SCSL. Taylor's counsel cited the leaked cable and the court's decision as evidence of an international conspiracy against Taylor. Taylor appealed against the verdict, but on 26 September 2013 Appeals Chamber of the Special Court confirmed his guilt and the penalty of 50 years in prison. On 15 October 2013 he was transferred to British custody, and began serving his sentence at HM Prison Frankland in County Durham, England. Taylor's attorneys filed a motion to have him transferred to a prison in Rwanda, but in March 2015 the motion was denied and he was ordered to continue serving his sentence in the U.K. In 2017 it was found that he had been making phone calls from the prison to provide guidance to the National Patriotic Party and threaten some of his enemies. ^ Library, C. N. N. "Charles Taylor Fast Facts". CNN. Retrieved 22 May 2017. ^ "Ex-warlord Charles Taylor's family say he is being 'ill-treated' in British jail". The Telegraph. London. 29 October 2013. Retrieved 11 April 2014. 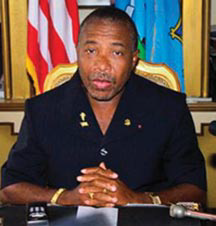 ^ "Liberia's Charles Taylor transferred to UK". BBC News. BBC. 15 October 2013. Retrieved 11 April 2014.